Chicken soup is good for the soul. It's also very good colds, comfort on a cold day and as an expression of love as I always look at home cooked meals. These whole pieces of chicken, slowly simmered with just a few ingredients, magically turn chicken and water into a bold and flavorful meal so satisfying it’s like a food, medicine and love all in one pot. So what is Caldo de Pollo? Caldo de Pollo in Spanish is just soup (caldo) of chicken (pollo). My fiance and I made this soup on day four of my Blueprint Challenge--cook a meal from a different cuisine. 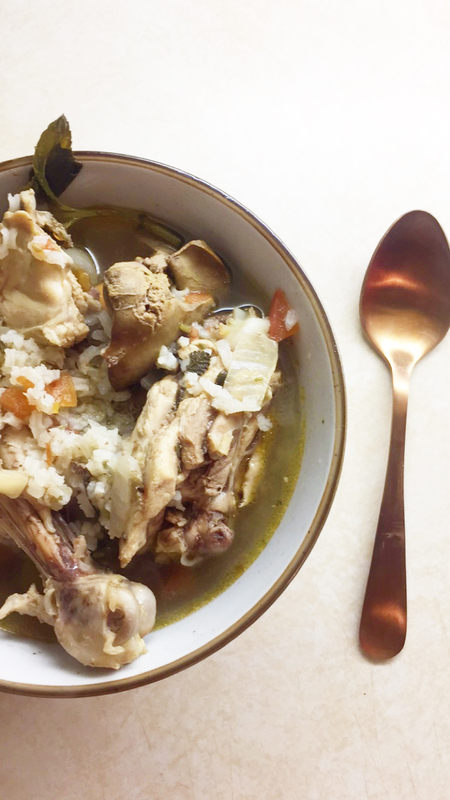 It's an authentic mexican chicken soup recipe that starts with chicken and always use a whole chicken with bone in pieces to add flavors. 1. Clean and rinse chicken. 2. Place chicken in pot with water. Add Sabor de Pollo seasoning and garlic, onion and allow the water to boil. Cook for 20 minutes. 3. After chicken has cooked for 20 minutes, add tomatoes, carrots, potatoes, serrano pepper, and oregano. 4. Cook for another 20-30 minutes. Turn the fire down and add the mexican squash. Cover. 5. Allow the squash to cook for about 5 minutes. 6. If you'd like, cook tortillas or serve with rice.